A lion rampant holding in the dexter paw a fleur d ’lis Or. 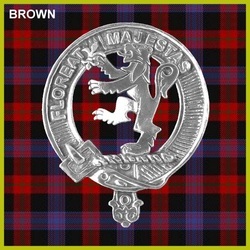 Brown or Broun is the second most common name in Scotland and is also found frequently in England and the USA as well as other parts of the world. It might be thought that a name such as this, which was spread so widely, would not have a specifically Scottish pedigree. But the Broun family (spelt thus) has a crest recognised by the Lord Lyon King at Arms and is included in the list of clans and families maintained by the Standing Council of Scottish Chiefs. They also have a recognised tartan. The French “Le Brun” from an adjective meaning brown or dark red appeared early in England (around 970). It seems to be a name describing the appearance of the original bearer. A family of this name were owners of Cumberland lands shortly after the Norman conquests but did not arise in Scotland until the 12th century. Walterus Brown was involved with the church in Glasgow in 1116 and Richard de Broun and others with the same surname signed the Ragman Roll in 1296 when all the nobles and landowners were forced to swear allegiance to King Edward I of England. A long line of Browns, which can be traced for 850 years, is the Brouns of Colstoun in East Lothian. The first of the line may have been Sir David le Brun who gave the land and witnessed the charter founding the Abbey of Holyrood House in 1128. These Brouns claimed that they were originally descended from the royal house of France - their arms bore the three gold lilies of France. The Broun arms registered with the Lord Lyon has a lion rampant holding a French “fleur de lis”. The Brouns of Colstoun also claim descent from George Broun who in 1543 married Jean Hay second daughter of Lord Yester, ancestor of the Marquess of Tweeddale. The dowry consisted of the “Colstoun Pear” which was said to have been invested with wondrous powers by the 13th Century wizard and necromancer Hugo de Gifford of Yester. This pear was meant to ensure unfailing prosperity on the family which possessed it. The pear was said to have been as fresh as the day it was picked until in the 17th Century a pregnant descendant, longing for the fruit which was out of season, took a bite of it, whereupon it became as hard as rock. Sir John Brune was High Sheriff of Aberdeenshire in 1368. Patrick Broun of Colstoun was created a baronet of Nova Scotia in 1686, the title to be passed on to his male heirs. On his death he left only a daughter who inherited his possessions while the title went to the Thorndyke branch of the family. Members of a younger branch of Broun of Colstoun settled in Elsinore, Denmark where they became prominent merchants; the name is still found there today. The 13th Baronet is Sir William Windsor Broun who lives in New South Wales, Australia. Robert Brown, who was born in Montrose in 1773 was a botanist who worked in Australia. His experiments on powder suspended in water resulted in a phenomenon known as the “Brownian Motion”. Agnes Broun was the mother of the poet Robert Burns and the name occurs frequently in Ayrshire. James Brown of Lochton was the provost (roughly the mayor) of Dundee in 1844-47. George Brown of Edinburgh immigrated to Canada in 1843 and was influential in the purchase of the Northwest Territories by Canada. The name Brown was adopted by a fair number of Highland clansmen when they wanted to get rid of their cumbersome (or at times politically incorrect) Gaelic names. John Brown, Queen Victoria’s famous gillie may have been in this category. Additionally, it has been suggested by some researchers that at least some of Celtic origins may have been named after local judges who were called “brehons”. Browns are regarded as septs (sub-branch) of the Lamont or Mac Millan clans. Brown was the 2nd most frequent surname at the General Register Office in 1995.